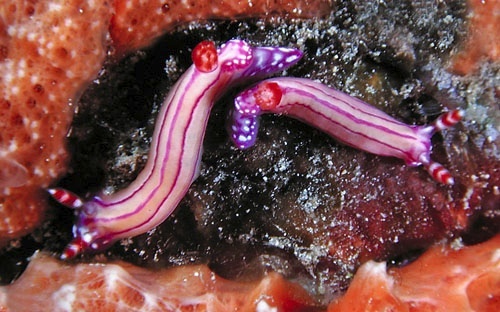 Identification: This dorid has an elongate, cream body with three parallel purple-pink lines running the length of the notum. The anterior and posterior mantle margins as well as the posterior margin of the foot are purple with raised white spots. The rhinophores are white with two bands of red-orange and the gills are cream with orange on the distal 2/3 of the rachis. Natural history: Hypselodoris alboterminata is a moderately rare, diurnal species found on rocky bottoms in moderately protected to highly exposed locations from 3-23 m (10-75 ft). Distribution: Big Island, Maui, Oahu, Midway and Kure. Taxonomic notes: This species was listed as "white dots" in Bertsch and Johnson, 1981 and was first recorded in Hawaii by Scott Johnson. It's also listed as Hypselodoris sp. 2 in Hoover, 1998. The name means "white ends" in reference to the white dots on the anterior and posterior ends of the animal. It's referred to as the "white dot nudibranch" in Hoover, 1998 & 2006. Photo: Mike Severns: largest, 18 mm: found by PF; Makena, Maui; April 19, 1989.